Don't know which Jeep model you have? Our Jeep Model Index will help you identify your Jeep. Round Fenders, Round Headlamps, 59" Windshield Frame, Bottom Hinged Tailgate. Trim Levels: "Laredo", "Renegade", "Golden Eagle", "Scrambler"
Wheelbase: CJ-5 84" • CJ-7 93.5" • CJ-8 103.5"
Rectangular Headlamps, 55" Windshield Frame, Square Front Grille, Side Hinged Tailgate. Round Headlamps, Coil Spring Suspension, Side Hinged Tailgate. 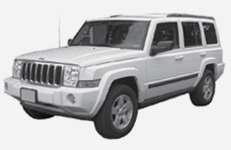 Trim Levels: Sahara", "Sport", "Rubicon", "Unlimited"
Round Headlamps, Longer and wider than all earlier Wranglers. Available in either 2-Door or 4-Door. The Original SUV. Grand Wagoneer has "Woodgrain" siding. 2-door and 4-door models. Classic big body style. Grille and cab are very similar to the Grand Wagoneer and full sized Cherokee. Famous "Downsized" SUV, Square Body, Rectangular Headlamps. Downsized Pick-up. Grille and cab are very similar to the XJ Cherokee. Rounded Fenders, Square Headlamps, Rectangular Grille, Quad Coil Suspension. Slotted Tail Lamps, V-Shaped Grille. Trim Levels: "Laredo", "Limited", "Overland"
Double Rounded Headlamps, Wider Body (84.2"). Captures the style of old XJ Cherokee but larger, with 7 Seats. Very similar to the WK Grand Cherokee in performance. The "New Look" with the Classic Jeep Grille and round headlamps.